I remember as a small child playing with the little playground sandbox excavators. I would dig as deep as I could, and when I reached the depth limit of the toy, I would spin around and start a new hole. Digging holes was a lot of fun and I would would waste many a lunchtime doing it. As adults we often don't have the opportunity to do the simple things that made us happy as a child, but now thanks to a new attraction in Las Vegas, we can all be excavator operators again, but this time for real. 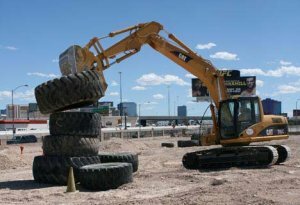 The Las Vegas attraction called Dig This, lets anyone take a simple course on how to use heavy equipment, then go out to a large 5-acre sandbox and dig away and run though games and skill exercises. For $210 you get an hour and a half of play time on an excavator. Packages run up to $750 for both excavator and bulldozer time. The reviews are in, and people love it. Will you be trying this out for yourself the next time you are in Vegas? Video after Read More.